The rate of incidents per 100,000 residents for the two most common sexually transmitted diseases (gonorrhea and chlamydia) and calculating a weighted average between the two. Compared to 2016 ranking, the top ten worst states all experienced a rise in the rate of gonorrhea per 100,000 residents. In Alaska (#1), Mississippi (#2) and Georgia (#4), the rate rose by more than 40 per 100,000, enough for Alaska to maintain its status as the worst state in United States. Chlamydia rates also rose in most U.S.states. Delaware’s (#9) rate of chlamydia infection increased by over 60 per 100,000, enough to bring it into the top ten. Mississippi’s infection rate jumped by a whopping 91.9 per 100,000, pushing it up to #2 overall. 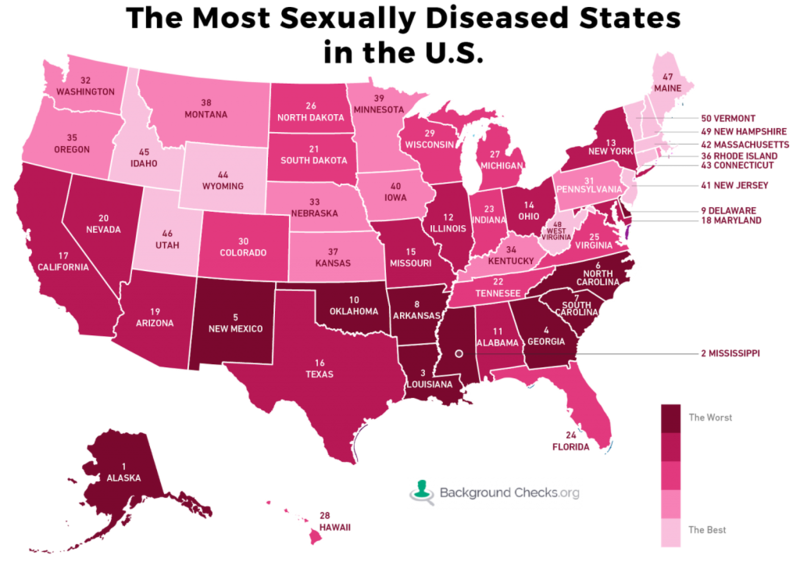 Other U.S. states fared better, including North Carolina (#7), Louisiana (#2) and New Mexico (#5) which all experienced a decrease in chlamydia infections per 100,000.